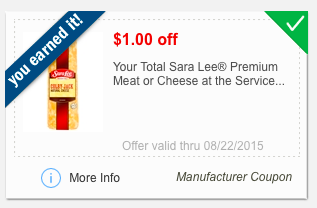 Sara Lee mPerks coupon - cheap deli meat or cheese! Cheap Sara Lee Premium meat or cheese at the deli counter! I used the above coupon this morning and when I checked my account for something I had noticed it had come back again! My tip would be to ask for a dollar value that you would like to be close to! You can also ask for 1/4lb of something too! Whatever work's for you!! I will be going back again to get more cheese!